A white paper recently published by Asia-focused management consulting firm Solidiance highlights key initiatives taken by Vietnam to develop smart cities in Ho Chi Minh City and Hanoi. 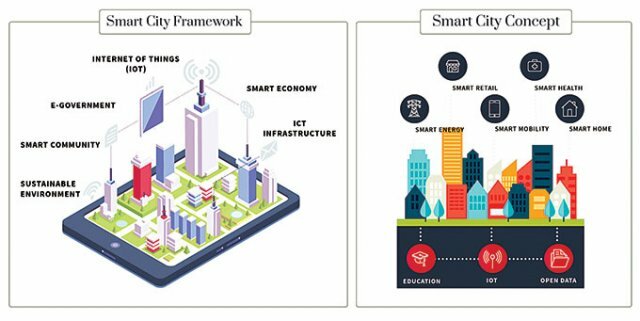 A smart city is generally defined as a city that leverages technology to manage and enhance quality of life, improve services, and use energy resources efficiently. Partnerships between the public and private sector are making progress to integrate smart city technologies into basic bureaucratic processes and government management systems in Ho Chi Minh City and Hanoi, and 33 cities and provinces in the country have already begun implementing smart city initiatives. VNPT and Microsoft began collaboratively deploying smart city development platforms in Ho Chi Minh City and Hanoi in December 2017. Trilliant Networks, a global internet service provider, partnered with the Ho Chi Minh City Power Corporation (EVN HCMC) and built Vietnam’s first smart city communications platform pilot, at Saigon Hi-Tech Park, in May 2017. In Hanoi, Microsoft signed a memorandum of cooperation to support the city in developing technologies for smart cities, such as e-government, healthcare, education, and data collection for management. Local companies like Viettel, VNPT, FPT Group, and Nhat Cuong are also supporting the initiative. The estimated budget for developing Hanoi into a smart city is around $3 billion. It will spend approximately $350 million from the national and city budgets, with the remainder to be raised from private sector investors or by implementing certain public-private partnership (PPP) models. Ho Chi Minh City will become the first smart city in Vietnam. It is focusing on cloud computing infrastructure, big data, building data warehouses / data centers and security-monitoring centers, and developing an open data ecosystem to achieve its 2020 goal. In addition, the city is planning to introduce smart solutions in healthcare, food safety, education, traffic management, flood control, and law enforcement. The Ho Chi Minh City People’s Committee announced plans in March to develop Can Gio district into a smart urban area, while all districts in the city are expected to have “smart development plans” by 2020. A memorandum of understanding (MoU) was signed in April, and the pilot for Can Gio will also begin in Districts 1 and 12 and Thu Thiem ward in District 2. Meanwhile, the American Chamber of Commerce has announced a collaborative effort between the government of Ho Chi Minh City and the International Finance Corporation (IFC) to develop the PPP structure to fund the development of smart city systems, particularly in Districts 2 and 9 and Thu Duc, where a large amount of manufacturing and technology are now being centralized. 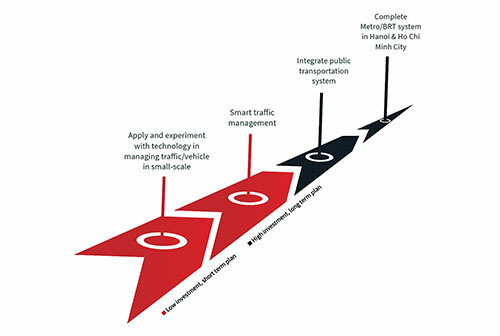 The city also plans for a smart city transportation network in new urban areas such as Thu Thiem, in order to ease traffic congestion, reduce emissions, and improve traffic safety. The Thu Thiem Eco Smart City project, funded by South Korea’s Lotte Group, is a 7.4-ha project that will to have a trade and finance center, hotels, office towers, and serviced and residential buildings, at an expected cost of $1.9 billion. A proposal from Vigilant Solution Inc. was received in 2016 for a smart transportation system and a network of 12,000 fixed and mobile cameras will be installed around the city. Hanoi: Most modern smart city in Southeast Asia? Hanoi aims to be a smart city by 2030 and focuses on four major sectors: healthcare, education, transport, and tourism. It has already implemented parking systems that allow users to search for parking lots and pay through mobile devices and is planning to launch it in all districts by the end of this year. It is also developing a digital traffic map to manage public transport. In education, 2,700 schools and universities have introduced electronic school reports and family-to-school contacts as well as online enrollment systems. Regarding healthcare, the city was the first to introduce e-documents in its health management system, with 900,000 records so far. By 2020, the focus will be on developing core infrastructure and smart applications, while the second phase, from 2020 to 2025, will focus on making the solutions operational. The construction of a smart city in Dong Anh province, worth more than $4 billion, will begin in October. A joint venture between Vietnam’s BRG Group and Japan’s Sumitomo Corporation, Japan’s Nikken Sekkei Architecture Company has been tasked with designing the 310-ha city. In order to move towards a more sustainable city model to confront challenges caused by rapid urbanization, Ho Chi Minh City’s Department of Information and Communications has partnered with Microsoft on smart city initiatives, including building a cloud-based platform for real-time monitoring of city traffic, parking spaces, and public bus routes in 2016. Hanoi has different plans to reduce traffic congestion and develop smart city initiatives. In May 2017, it began piloting the iPARKING app for parking on Ly Thuong Kiet and Tran Hung Dao Streets. Other projects, such as upgrading traffic signal control systems and related equipment, adding more equipment and databases to improve the efficiency of the GPS tracking system, and efforts toward replacing bus tickets with transport cards, have also been implemented. Concurrently, Ho Chi Minh City launched a mobile app - TTGT TP.HCM - providing maps, traffic updates, and routing information. While progress has been made, the two cities will still need to establish more smart city initiatives to minimize the consequences of severe traffic congestion seen in other large Asian cities. Ho Chi Minh City and Hanoi are facing increasing population growth driven by rapid urbanization and will need to make substantial changes to promote sustainable living. Over the last decade, the urban population in Vietnam has grown at an average of nearly 3 per cent a year - the fastest in Southeast Asia - with Hanoi and Ho Chi Minh City growing 3.8 per cent and 4 per cent per year, respectively. Increasing population density is also adding pressure to aging infrastructure and is impacting the environment. In an effort to reduce these urbanization challenges, the Vietnamese Government is moving towards a growth model that promotes an ecological balance between public health and safety and infrastructure and urban development. Smart city developments are seen as a necessary component to push for sustainability in urban cities, along with better public transport, green spaces, and green buildings. Michael Sieburg is an Associate Partner at Solidiance, based in Ho Chi Minh City, and the author of the white paper “Transforming Ho Chi Minh City and Hanoi into Sustainable Cities of Vietnam”. Solidiance is a corporate strategy consulting firm focused on Asia. The company advises CEOs on deals, defines new business models, and accelerates growth in Asia. Solidiance’s expertise is focused on industrial development, construction materials, green buildings, and urbanization, with offices in 13 Asian countries, including Vietnam.